Grupo Costa Este the incredible Spanish brand which has venues in Barcelona, Marbella and Madrid is finally coming to the UK and this shall be their fourth Opium. Situated in Piccadilly, which has great travel links, this 500 capacity venue splits into restaurant bar lounge and club spaces. However it can open as one huge venue for events, conferences meetings and we can remove some of the furniture from both sides to create spacious blank spaces. The restaurant seats 100 people or holds 250 as a standing space. 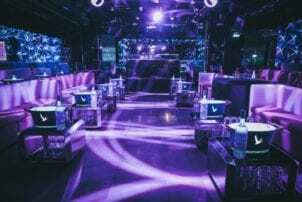 It has a lounge, a raised seating area for 26 and a VIP Box for seating or standing receptions that over looks the club – but can be kept private also. The club has 3 level tiered seating, a long bar, stunning led screens and lighting installations. The menu has been designed with the Chefs in Spain but also bringing in some of the London trends and likes. Experts in design av music and hospitality have created this amazing venue that is perfect for private and corporate entertainment. We have floor to ceiling led screens, 2 dj booths, 2 cloakrooms, plenty of bathrooms, lift and amazing sound and lighting. The led’s alone will create and transform the spaces and are already being asked to be used to create the feeling of an indoor circus for one party coming in the near future, they can also be used for branding and showing films and projections.